Pau is a town in the Pyrénées-Atlantiques department of Aquitaine, about an hour north of the mountains and an hour to the east of Biarritz and the Atlantic coast. Go to Pau on a sunny day and you will be absolutely spellbound by the view from the Boulevard des Pyrenees. The green lower hills of the Pyrenees are across from your raised vantage point on the Boulevard and the snow-capped mountains lie behind. In the foreground you have the palm trees contrasting dramatically with the mountainous landscape beyond. This is why people come to Pau, and this combined with a magnificent castle, some wonderful architecture in the town, good shopping, excellent golf and some English style gardens make the town worth a visit. Napoleon himself ordered the wall of the Royal Square to be knocked down opening up a wonderful vista to the residents and visitors of Pau. Adolphe Alphand, a colleague of Haussmann, Paris’ most famous town planner, designed the Boulevard des Pyrenees complete with its natural balcony. The boulevard runs from the chateau at one end to the Palais des Congres at the other and is high with the main city behind it. The slope of the Boulevard is planted with dozens of palm trees which with the views make this such a wonderful walk. Next to the Palais des Congres is Beaumont Park, a wonderful spot for a picnic or to escape the bustle of city life for half an hour. Some of the trees in the park are more than a 100 years old. The streets around the castle contain examples of 16th, 17th, and 18th and 19th century architecture and it is a pleasure exploring the streets in this area. Pick up the leaflet ‘Guide History and Heritage’ from Pau tourist office to be sure to spot all the details, from ‘lucky' hound shaped door handles to sculpted stone arches. Pau castle was the birthplace of King Henri IV. It was also the fortress of the Viscounts of Bearn and a royal residence during the renaissance. Parts of the castle look quite austere but the main entrance is lovely. 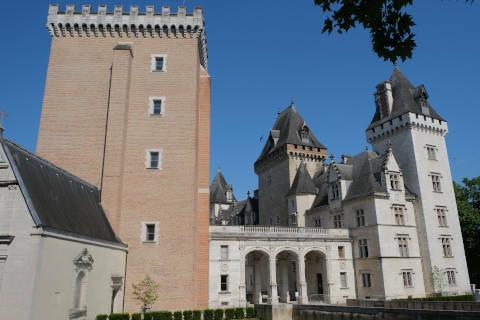 The original 14th century castle of Gaston Febus was converted into a Renaissance chateau by Marguerite d’Angouleme who surrounded it by gardens. These too are in the Renaissance style. It is her grandson Henri who became the king of France and the turtle shell that was his first cradle can be seen in the château. The chambers in the west wing were decorated by Louis-Philippe for his wife Queen Marie-Amelie and later were frequently used by Eugenie, the wife of Napoleon, as she travelled between Biarritz and Bearn. Both Louis-Philippe and Napoleon bought many tapestries to adorn the walls of the chateau which has, of consequence, one of the biggest collections of tapestries in France. On the third floor of the castle you can visit the Musee Bearnais, a museum of Bearnais architecture, furnishings and other aspects of Bearnais life. The Money Tower, la Tour de la Monnaie is on the other side of the Renaissance gardens from the castle. This is where the Bearn coins were minted up until the revolution. The coins had the king’s head on one side and young cows on the other! In the Hedas quarter which is Pau’s oldest residential quarter there is the Bernadotte Museum. Jean Baptiste Bernadotte was a brigadier general in Napoleon’s army who fought for France but was also a hero in Sweden, where rather remarkably he was offered the throne in 1810. His descendents still reign in Sweden. Another museum in Pau is the Fine Arts Museum, the Musee des Beaux Arts. This is a good museum with works by Rubens and Degas amongst many others. The pride of the collection is ‘The New Orleans Cotton Office’ by Degas. Beamont Palace at the other end of the Rue des Boulevards from the castle was built as a winter palace in 1900 at the request of foreign wealthy holiday-home owners. It is now a casino and conference centre. It is a large neo-classical building and a large pond has been built in front of it by the architect Francois Lombard, which reflects the façade in the water. Pau has strong English ties. A Scots doctor, Alexander Taylor, came to Pau to recover from Typhus and he was so impressed by the healing powers of Pau’s climate that he wrote a book, and a flood of rich British followed him. Many built large villas and English style gardens, some of which can be visited today. Ask for details at the tourist office. Pau also became the sight of the first European golf course, a course with a very good reputation today. While it is true that the pilgrimage town of Lourdes has two opposing sides with excessive crowds and tourism competing with the spiritual aspect of the most visited pilgrimage town in France, it is still a fascinating destination (to visit if not perhaps as a place to stay too long!) and quite easy to get to from Pau: see the Lourdes guide.